The genus Rapala comprises of several small, stout-bodied and powerful flyers. These big-eyed species can zip around at tremendous speeds, earning them their English common name of "Flash". Of the many "Flashes" found in Singapore, the Yellow Flash (Rapala domitia domitia) stands out in that the undersides of the butterfly are a distinctive bright yellow with jet-black markings. 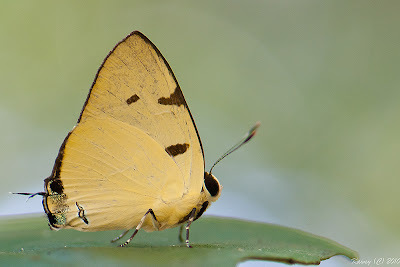 The largest member of the genus in Singapore, the Yellow Flash is considered rare but can be observed with regularity at certain locations within the nature reserves. This Yellow Flash was shot a couple of weeks ago by ButterflyCircle member Nelson Ong, who has been patiently tracking this species for a long time. Having spotted the species many times, this was a satisfying success for Nelson, who finally managed to nail a well-composed shot of this skittish Lycaenid after a long period of hunting this elusive beauty.